High Doses Of Experimental Drug Implicated In Botched French Study : Shots - Health News In January, one person died and five others were hospitalized during a test of an experimental drug in western France. Scientists are still trying to figure out exactly what went wrong. 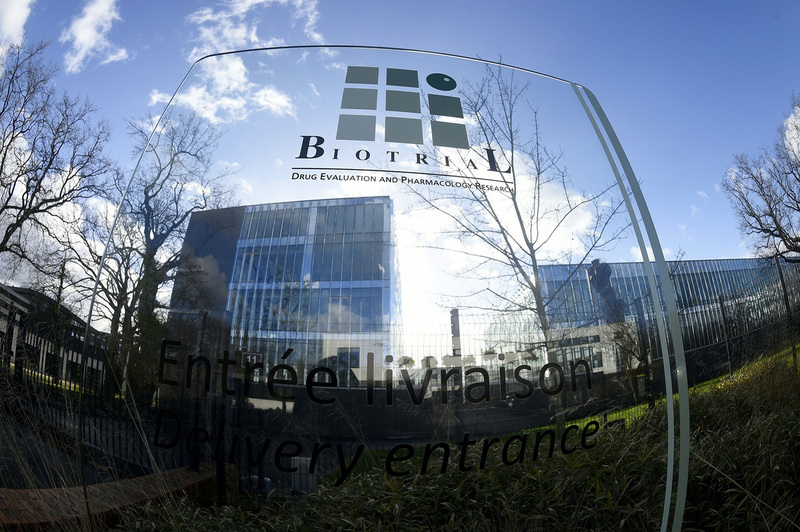 A clinical trial at the Biotrial laboratory in Rennes, France, left one person dead and put five more in the hospital. An investigation into a clinical test in France that left one person dead and put five in the hospital has found evidence of brain damage in people who took high doses of the experimental pain medicine. The early-stage clinical study, conducted by Biotrial in France, was halted in January when the side effects surfaced. It was the first time the drug, made by the Portuguese company Bial and known as "BIA 10-2474," was tested in humans. A report released Monday by a committee of scientists says people who got high cumulative doses of the drug sustained damage to their brains, specifically the hippocampus and pons. Those who got lower doses had no consistent adverse reactions. The reports says the patients' symptoms and injuries were "completely unusual, with no relatedness to a known disease or toxicity." Previous tests in rats, mice, dogs and monkeys involved doses up to 650 times those given to human subjects. While some animals had brain damage or died when given extremely high doses, there were no consistent signs indicating the drug would be unsafe for humans. The molecule is meant to inhibit an enzyme called fatty acid amide hydrolase with a central role in the endocannabinoid system, a set of receptors also involved in processing THC, an ingredient in marijuana. In all, 90 people took the experimental drug, at different doses. The six who were hospitalized had gotten the highest dose, which was 10 to 40 times higher than that needed to completely block the enzyme. "We don't know by what mechanism the molecule caused these lesions, and I fear we won't know it for a long time since they couldn't have been due to the endocannabinoid system that was targeted by the molecule," Dr. Bernard Begaud, who leads the scientific committee investigating the incident, told the French publication Sciences et Avenir. Two similar compounds were abandoned by other companies because they weren't deemed effective. Often, the intensity of a drug's side effects increase with the dose. But in this case, the investigators note, there was no sign of a linear pattern. People who received a cumulative dose less than 200 milligrams were, for the most part, fine. But all six patients who received a cumulative dose higher than 250 milligrams had "serious central nervous system symptoms." At those doses, the report authors hypothesize, the molecule may have suppressed the target enzyme too much, preventing it from breaking down other chemicals. That may have allowed a chemical like anandamide, which is present in chocolate in tiny amounts, to build up to dangerous concentrations in the brain. Another idea is that the molecule acted on unintended enzymes or that it produced toxic byproducts in the brain. The group, set up by the French National Agency for Medicines and Health Products Safety, will reconvene later this month to review hypotheses on what went wrong and to make recommendations to the French government to improve clinical trial regulations. The committee has also asked Bial to explain why the company did preliminary studies in four species of animals, as opposed to the usual two, why it decided to continue studies on the potential pain reliever when it only worked in two animal tests, and why it chose to test such high cumulative doses in people. The U.S. Food and Drug Administration is also investigating the case. The agency said in late January that while this drug hasn't been tested in the U.S., there are studies on other drugs that work the same way.